Overwrap bar wrappers are designed to place a wrap over a product that has already been enclosed within packaging. Similar to putting a film wrap around a soap bar already in a carton. This may be a paper or film wrapper over a carton, box or an additional wrap, to provide extra protection, decoration, or transparent design overlay. Pester Model Pewo Fold, automatic, cut and fold, horizontal overwrapper that can also be operated as a band sealer rated up to 50 cycles per minute with number of packages – depending on materials and application. Package size range: Length to 250mm (9.85"); Width to 400mm (15.75"), Height to 140 mm (5.5") and is capable of running polyethylene, polypropylene and PVC films, with minimum / maximum film widths of: 90mm (3.6"); 400mm (15.75") and minimum / maximum film thickness of: 0.02mm to 0.05mm. Equipped with waterfall up ender, up-stacker, multiple row collation, film registration, metric scales for adjustments, dual film arbors, empty roll sensor, static eliminator, hand crank adjustable with in feed / discharge belt conveyors and statis light. Control panel has PLC. controller with push button controls and e-stop with sealing jaws, back-up time and machine function statis gauges. Mounted on base frame with interlock safety guarding, casters and leveling legs. Package Machinery, Model UE-6, horizontal overwrapper capable of wrapping trays, boxes, and bundles from 10 to 40 packages per minute – depending on materials, application and machine configuration. Package size range: 5 to 14" in Length; 3 to 9" in Width; 1" to 5" in Height, with maximum roll Width of 24". Equipped with 60" long x 9" wide product conveyor set on 15" centers and 28" long hot knife cut-off. Control panel with touch pad conttroller with read out and digital temperature controls for knife heat, bottom heat, right side heat and left side heat. Mounted on heavy duty base frame with casters. Scandia, Model 725, automatic, expanded turret type over wrapping machine. Rated from 50 to 200 CPM – depending on materials, application and machine configuration. Package size range: 1½" " to 3¾" in Length; 3" to 7½" in Width; 1" to 2¼" in Height. Equipped with 6" wide x 45" long infeed belt, 24" long top chain transfer section set on 12" centers, film feed head, knife film cutting section, (8) station expanded rotary turret, film tuckers, lugged delivery chain, tear tape applicator, side tuckers and folders and 18" long dual heating section. Control panel with an AB PLC and AB PanelView 550 touch screen HMI. Scandia, Model 720, automatic, turret type over wrapping machine. Rated from 50 to 350 CPM – depending on materials, application and machine configuration. Package size range: 1(5/8)" to 3¼" in Length; 3½" to 7½" in Width; (7/16)" to 1½" in Height. Equipped with 6" wide x 70" long infeed belt, 24" long top chain transfer section set on 12" centers, film feed head, knife film cutting section, (6) station rotary turret, film tuckers, lugged delivery chain, tear tape applicator, side tuckers and folders and 18" long dual heating section. Control panel with an AB PLC and touch screen HMI. Pester Pewo-Fold, Automatic collator / overwrapper / bundler rated from 15 to 45 cycles per minute with number of packages – depending on materials and application. Package size: 2-1/2" to 9-1/4" in Length; up to 14" in Width; 3/4" to 5-1/2" in Height. Max seal width: 15-3/4" and film roll up to 16" wide. Equipped with 8-1/4" wide canvas infeed belt at 31" high, 4" high width adjustable side belts, adjustable height top guide rail, 7" wide side and rear pushes, metric scales for adjustments, empty roll sensor, with 6" wide film roll, control panel has PLC controller with push button digital display controls, statis light bar and mounted on screw down height adjustable legs. Scandia 622, Automatic cut & fold over wrapper rated from 120 to 300 cpm – depending on materials and application. Package size range: 2-1/2" to 6" in length; 2-1/4" to 8" in width; 1/2" to 2" in height. Equipped with dual web arbors. BFB Model 3702, Automatic, collating and wrapping machine rated from 10 to 30 multipacks per minute – speeds depending on materials and application. Package size range: 50 to 300mm in Length x 30 to150mm in Width x 50-220mm in height. Capable of full or band wrapping. Equipped with star wheel product up-ender, collator and tear tape applicator. Films used: Most Heat sealable and supported films. Film web width: 400mm. Marden Edward 1230FF27, Automatic, stainless steel, front feed, envelope end fold, wrapper rated from 20 to 60 wraps per minute – depending on materials and application. Package: (2"- 8")L x (3" – 12")W x (5/8" – 4")H. 3 1/2" front belt infeed, 10"L heated end film seal outfeed, 18 1/2"W max film width, mechanical flim draw (40"L max), hand crank size adjustment, and barrier guarding with electrical interlock. Mounted on stainless steel frame with height adjustable legs. Last ran soap bars in a pharmaceutical operation. Sollas, Model MINI, Cut & Fold style wrapper rated 10 to 60 cycles per minute depending on materials, application, environment and machine configuration. Product size range: (Length)- 40mm to 200mm x (Width) 20mm to 165mm (Height) 12mm to 80mm. Film width 50mm to 280mm. Equipped with a 7" wide x 60" long variable speed infeed conveyor and interlocking guards. (3) digital temperature controllers and push button controlls. 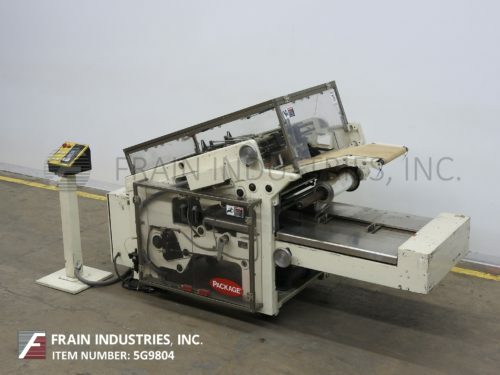 Scandia Model 110, automatic, overwrapper, for single or multi-packs rated from 20 to 80 packages per minute – depending on materials and application Package size range: 3" to 11-1/4" in Length: 1-3/4" to 11" in Width; 1/2" to 4-1/2" in Height. Capable of running heat sealable, cellophane, or polyproplene films of both 5-sided or 6-sided wraps. Equipped with 7-3/4′ long x 5-1/4" wide product feed chute, 80" long in feed conveyor, with dual 12" OD film disc’s on 2" OD cores, no container / no film, with rotary knife, cutting against stationary knife. Carton goes thru film and both are trapped between bottom and top plates for positive film positioning, top / bottom film folders and tuckers, lugged top chain assist conveyor, top plate and side heat sealers 60" long right angle lugged discharge conveyor set on 21" centers. Control panel with A/B controls with heat seal, static eliminator, web speed, hand, auto, off switches start, stop, e-stop controls with interlock safety guarding.